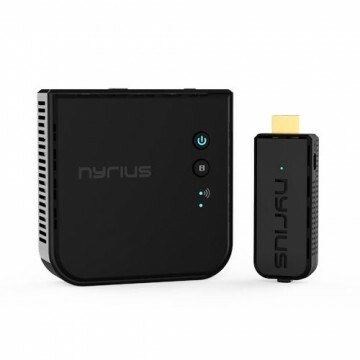 Make your music listening experience more enjoyable with Songo Portable by Nyrius. 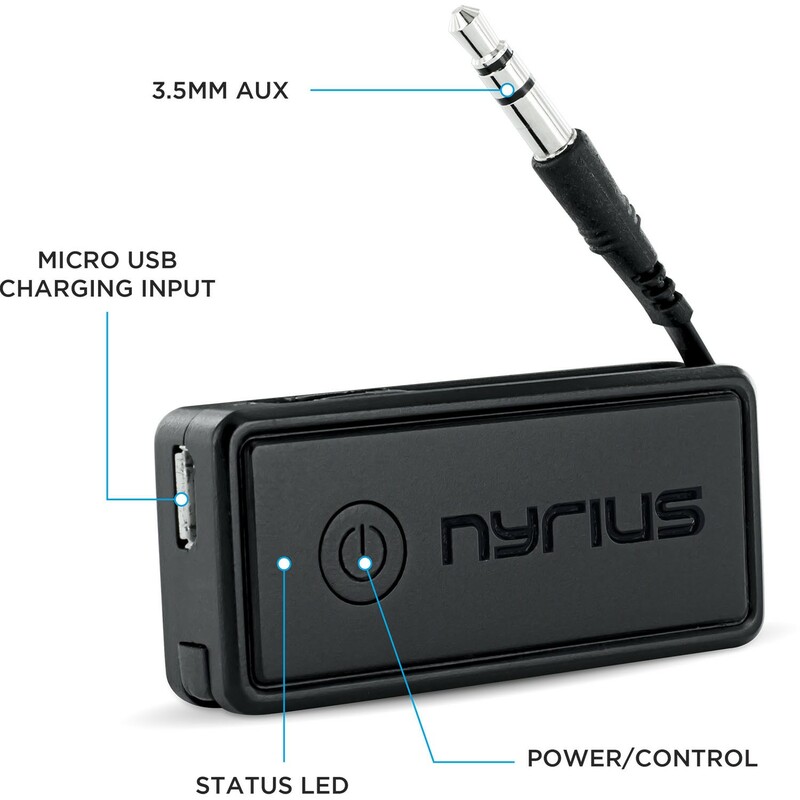 This compact Bluetooth music receiver allows you to conveniently stream your music playlist wirelessly from your smartphone or tablet to your car stereo, speaker system, and even add Bluetooth capabilities to your favorite headphones with the included headphone adapter. Easily start playing your tunes with the touch of a button and avoid the hassle of messy cables crowding your center console or limiting your stereo setup. Enjoy music freely in your car or home or even in the gym. Getting connected is as simple as plugging into any 3.5mm auxiliary input. Whether you’re on a road trip with friends, on the ski slopes, or doing yoga, rest easy knowing you’ll enjoy up to 12 hours of music on a single charge. Recharge the battery with the included micro USB cable. Advanced wireless technology delivers crystal clear audio up to 33 feet. Songo Portable is designed to deliver the fullest frequency range without any interference, unlike FM transmitters that can have a poor connection causing the signal to break up. As soon as you turn Songo Portable on, your smartphone will automatically connect so you can get listening quickly. Control your music from your smartphone or using Songo Portable’s simple interface - play, pause, or skip tracks with just one button. Voice notifications when power turned on/off, low battery, and connection status. 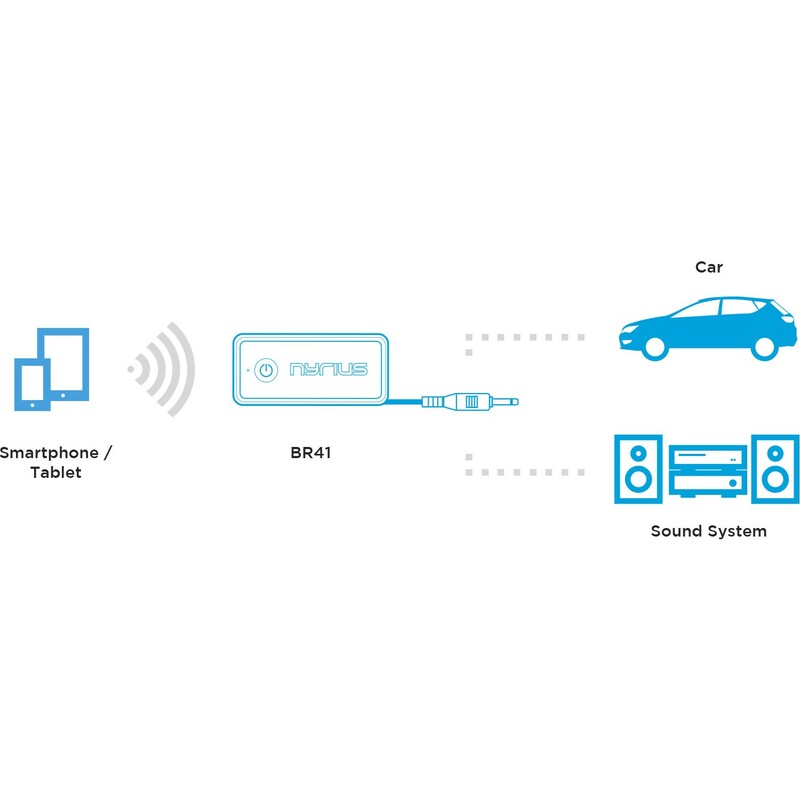 Share, control, and listen to music through your speaker system without wiring or docking your smartphone. 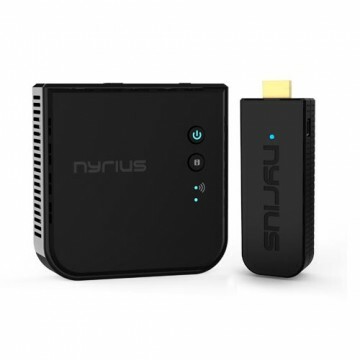 Setup is extremely simple - plug the receiver into your music system, wirelessly pair your audio device, and you're set. No software or app required. Use the included Velcro tab to conveniently mount Songo Portable to any surface such as your dashboard. Take Songo Portable wherever you go. 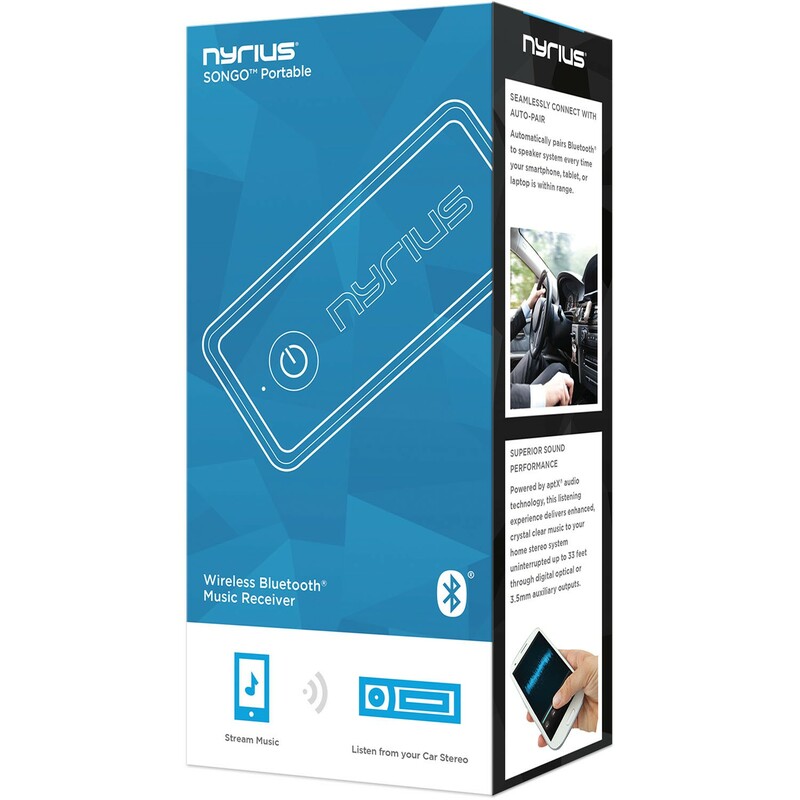 Plug into a friend’s car stereo, and let anyone with a Bluetooth audio device start streaming in seconds. Deliver music wirelessly to your headphones up to 33ft. Perfect for the gym, skiing, snowboarding or any other activities for when you want to keep your smartphone out of the way. Entertain guests at your next party by streaming iTunes, Pandora, Songza, Spotify, or SoundCloud wirelessly over your home speaker or docking system. 1 year manufacturer’s direct warranty. Great little device! Bought one for home (on Amazon) and now I'm buying again (direct) for my car. Rarely have to charge it. Plays my music without the delay/lag of my wife's in-car BlueTooth system. I LOVE my Nyrius Songo. I've had mine for a year (bought it on Amazon October 2016 ($7 USD). I actually was trying to buy another one, but was sad to find they've been discontinued. For a tiny adapter, the battery life on this thing is amazing. I don't know what the previous reviewer was talking about when stating this thing needs to be plugged in all the time, because it doesn't (because it's battery powered). Because it's battery powered, you have to turn it on every time, but if you've paired before, once it's on it will connect back to your device automatically. Really sad this thing is discontinued. Great product, easy to use, small (which I like), and Aleada in CS helped me when I had a pairing issue (which was easily resolved). Great product! 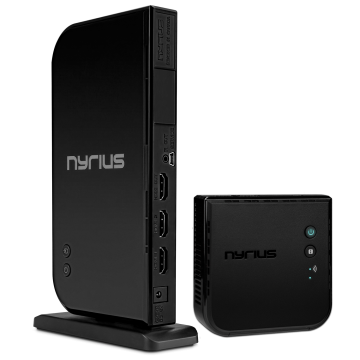 Simple to setup, sync and use with multiple devices. Easy to pair and sounds better than with an aux cable. 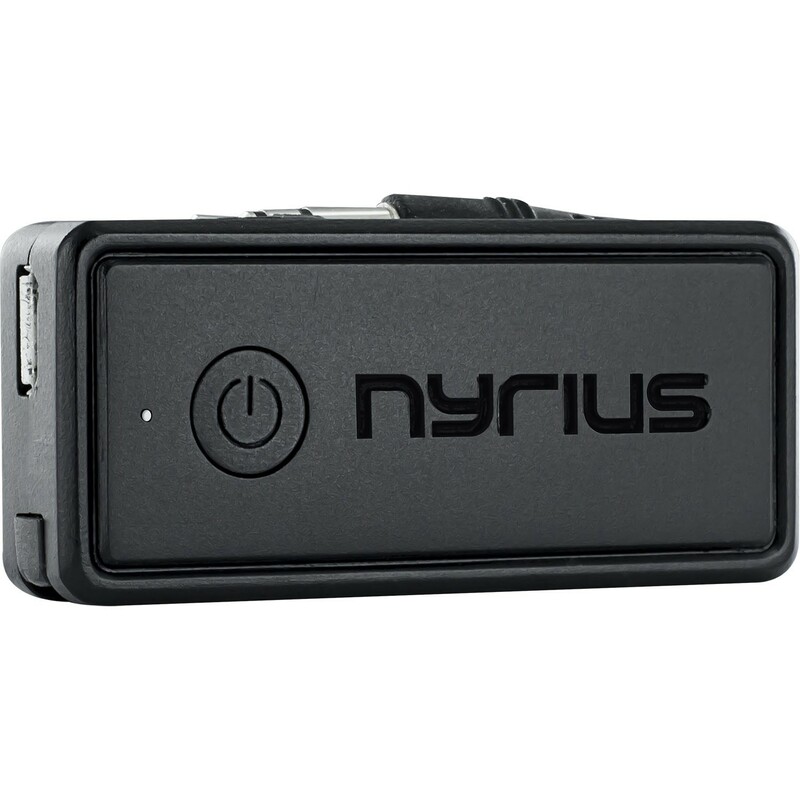 This is a really good product, I've only had it for a month or so but the music is very clear. Nice little gadget, honestly the price was a very good. Thought it wil handle calls (but i did not check it well before) so no call options here just music, anyhow good little piece. I use this in my AUX IN port. My car lacks USB input. This requires me to have a cig USB power adapter (to power this device), not included, the USB cable connected to this device and this device, all in my center console. Fortunately I have the space for this mess, and it's all tucked away so I can't see it. To start, I have to pair this device every time. Fortunately, pairing is incredibly fast with my iPhone 6 plus. It takes 2 seconds, maybe less. The only issue is the sound snaps or crackles randomly. I can't figure out why, and it's not consistent. But it's pretty minor. It works. And it's quite small. As a final note, if they ask you to write a review for an extended warranty, don't. It is a scam to fake bribe you with a review. To get your free extended warranty, they force you to go through ALOT of hoops. Completely satisfied with this product. Plugged it in the first time, and it worked. I've not had it lose connection once, unlike a lot of other bluetooth products out there. The sound is great! I might buy another for my home stereo too. My only complaint is the velcro it comes with is a round piece which causes the product to hang unevenly when mounted. If it came with a rectangular piece of velco it would probably mount more flush to the dashboard, and look more professional. So far so good! Easy to connect and sounds better than I thought. Sounds as good as XM on my BOSE speakers in my Cadillac CTS. It would be awesome if it had a microphone on it to serve as a music receiver and a hands free Bluetooth speaker phone. 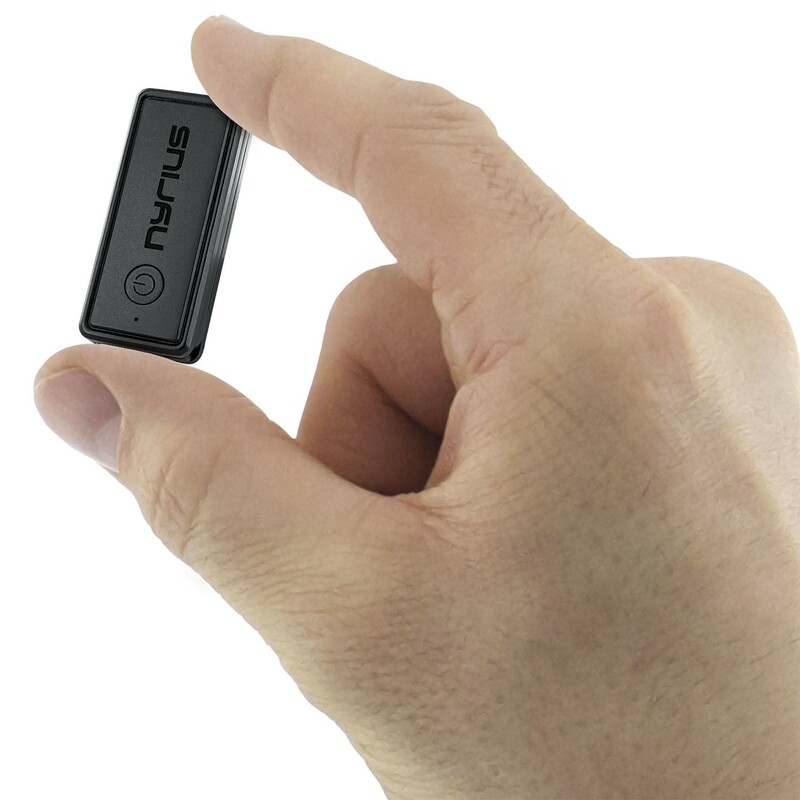 A great, inexpensive bluetooth receiver. Very very tiny and portable, and sound quality is good as well. Only caveat is that it seems to add a bit of bass boost to the output, which I could do without, or at least have option to turn off. I really like that it comes with a 3.5mm to 3.5 mm plug adapter.